This is a pair of Wide Wedge Buggy 2WD Front Carpet Tires. The Wide Wedge brings the popular Wedge tread pattern to a tire carcass that fits on standard 2wd Front Wheels! That means no more cutting wheels or needing special narrow 2wd front wheels. 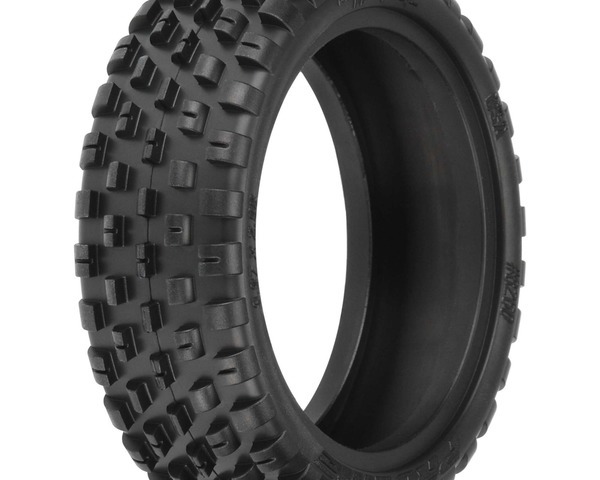 The extra tire width allows for an additional row of tread which the Pro-Line Engineers used to make the tire directional, meaning the tire can be mounted for either more aggressive steering or less! The Wide Wedge has a true drop-in bead that does not require cutting or hand fitting and is super low-profile just like you would expect out of your carpet tires. The Hook shaped pins that the Wedge design is known for provide all the steering you can handle without being grabby. Pro-Lines Z compounds provide unparalleled grip on a variety of surfaces used indoor (carpet, wood, cardboard, plastic, etc. ) while still being long lasting. Be on the cutting edge of carpet tire technology with Pro-Lines new Wide Wedge 2wd Front Tires!